Proper daily maintenance routines are a must for robot owners. A new year offers the chance to recommit to better daily routines. “Take at least 10 minutes a day on your maintenance and the robot will run smoothly,” said Chad Schumacher who operates a dairy using Lely robots in Minnesota. Schumacher discussed the importance of daily maintenance and automated milking with guests of the Lely Journey tour in December. Every dairy owner using a Lely Astronaut automated milking system works to achieve the highest performance. One of the most important tasks is to clean your Lely Astronaut milking robot daily. The use of good quality water and correct cleaning tools in and around the robot is of great importance. Below are some tips. Before replacing or repairing something, first wash the robot and rinse with cold water. In particular, the areas you want to inspect include the STDS, teat cups, cup cords, twin tubes, and 3-D camera (A4). This ensures that you can work more easily and hygienically. A clear field of vision is critical for the sTDS and 3-D camera. Keeping these components clean will help reduce connection issues. Use a soft moist towel with a small quantity of lens cleaner liquid (Astri TDS) to clean the sTDS screen. The 3-D camera should be cleaned with a soft moist towel with a small quantity of glass cleaner. You are advised to replace silicone liners after 10,000 milkings. Lely T4C gives an alert when it is time to replace these. Just remember to reset T4C after replacing. 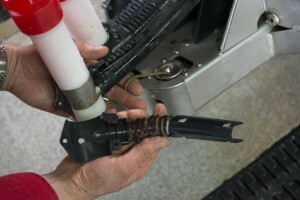 Changing the liners becomes an easy job when you use the specially designed tool. If you do not have access to this tool, consult your local Lely Center. A clean bleed hole is crucial for optimal milking and milk transport to the milk jar. A blocked bleed hole causes reduced milk flow, which results in a slower cup take-off and incorrect milking on one or more quarters. A higher Dead Milk Time (DMT) may even occur, with increased connection attempts and failures as a result. A specially designed bleed-hole needle is delivered with each robot. Lely advises you to clean the bleed holes twice a day. In addition to this check, please check the twin tubes visually for cracks and/or other damage. Duplo covers prevent teat cups from getting tangled and/or cracked, which may cause a critical alarm. Although the duplo covers themselves are made of solid plastic, some maintenance by cleaning is important. Any dirt and/or other contamination build-up in this area are a potential risk for bacteria growth. 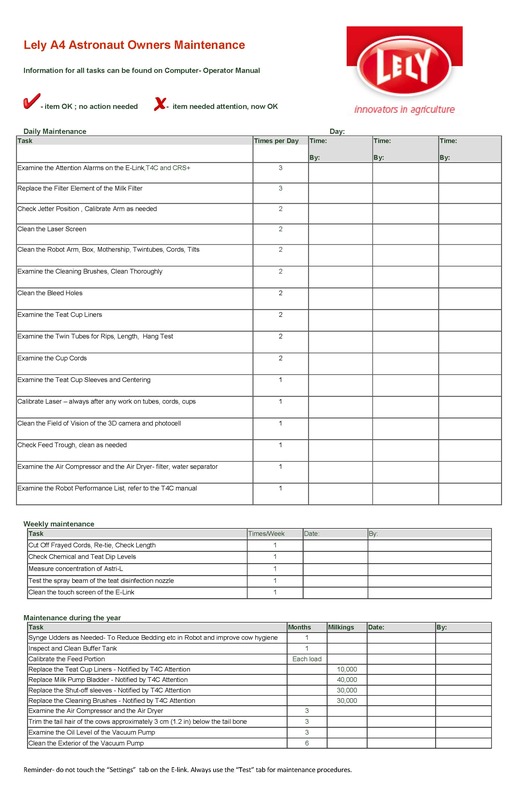 You may also use Lely T4C Report 56, ‘Robot performance’, to monitor, for example, DMT/MT differences. Once again, prevention is better than cure.